Trying to catch your breath can be a scary situation, especially when you are coughing, wheezing, and experiencing tightness in your chest at the same time. You can expect all of these symptoms with bronchospasms. Whether the root cause is an acute respiratory infection or an existing asthma condition, bronchospasm treatment may be within your reach. We have compiled a list of natural remedies for you. Bronchospasm refers to the constricting of the air passageways, also known as bronchioles. This can be caused by conditions affecting our breathing such as chronic lung diseases, reactions to external chemicals, and even hormonal fluctuations. Symptoms vary between individuals and can range from mild coughing to the more severe difficulty in breathing. Treatments target the symptoms and the underlying cause. Depending on your condition, there may be a variety of natural bronchospasm treatment options to try. 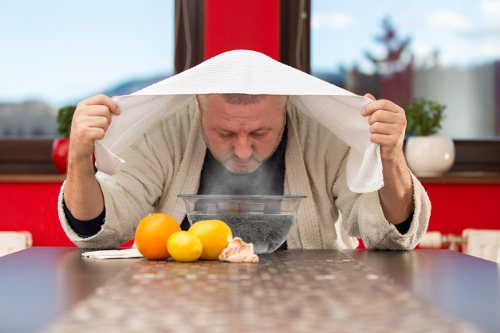 Bronchospasm treatment at home starts with making lifestyle changes to prevent the onset of attacks and symptoms. Learning specific breathing techniques and sleeping positions to help open the airways, as well as avoiding inhaling harmful pollutants such as smoke, can help in the prevention and management of the bronchospasm condition. Knowing how to breathe during a bronchospasm attack can help shorten the episode and prevent other symptoms from occurring. The Buteyko Breathing Technique is considered the best way to open the airways and increase the level of carbon dioxide intake. Short, shallow breaths combined with controlled and nasal breathing exercises are at the core of learning how to breathe correctly. A common remedy for any breathing or congestion problem is the use of steam, whether through direct inhalation or by creating a steam room with a hot water shower. You can add essential oils such as chamomile, peppermint, or elderberry bark to increase the beneficial effects. The cough and its effects on your throat may be tamed with the powerful properties of saltwater treatment. Gargle a solution of eight ounces of warm water and one teaspoon of salt for 15 seconds. Rinse your mouth with plain water afterwards. That morning cup of coffee could help ward off bronchospasm. Its theobromine and theophylline properties can work to open the air passageways and promote oxygen intake. A cup of black coffee may also help increase blood flow. We use apple cider vinegar for many things other than cooking. It contains potassium, which could thin mucus, and the antioxidant acetic acid may help with respiratory symptoms. Get the potential benefits by drinking a glass of water mixed with one tablespoon of apple cider vinegar. You might also enjoy a warm drink of water with equal amounts of raw honey and apple cider vinegar. The anti-inflammatory properties of curcumin in turmeric could target the inflamed lungs causing the bronchospasm. Grind turmeric into a fine powder, and combine one tablespoon with two tablespoons of raw honey for a daily treatment. This plant is known for its isopetasin and petasin properties, which are believed to combat allergies and headaches. Its anti-inflammatory and anti-spasmodic abilities may also help treat bronchospasm symptoms. Try taking seven grams of butterbur on a daily basis. We use black pepper to add natural flavor to our foods, but it also has incredible health benefits, according to ayurvedic tradition. The black peppercorn acts as an expectorant (loosens mucus) and an anti-inflammatory agent. Combine black peppercorns and tulsi leaves for a bedtime concoction. You may also improve your breathing with a soothing cup of chamomile tea, as it is said to help relax the respiratory system. Add chamomile to hot water and steep. You can also add one teaspoon of Echinacea root, passion flower leaves, and mullein leaves for a powerful punch to symptoms. Try treating the cough and soothe a sore throat at the same time with the components of thyme. Steep several fresh thyme leaves in boiling water for 15 minutes before drinking. Add honey or lemon for a sweet taste. Drink three cups daily. You can also use thyme essential oil as a steam treatment. The properties of eucalyptus may work as a decongestant to help to open the airway. It is found in various forms such as tea, oil, and balms. Breathing in the oil through steam inhalation may offer the best results. You could calm coughing fits with this homemade syrup. Combine one tablespoon of dried peppermint, three tablespoons of chopped ginger, and four cups of water. Boil for several minutes and simmer until half of the mixture is evaporated. Strain and add one cup of honey before ingesting one tablespoon of the syrup three times each day. We’ve mentioned adding honey to some of the drink remedies, but you can also take a tablespoon of the honey alone to help relieve symptoms. Do this three times each day, especially at bedtime. Many believe an asthma diet can also help prevent the bronchospasm condition. It calls for eliminating all sugar and dairy products from your daily diet. However, WebMD and the Mayo Clinic refute the existence of an asthma diet, but both sites offer dietary recommendations to prevent the onset of asthma complications. One of the common suggestions is to eat plenty of fresh fruits and vegetables to gain the benefits of antioxidants of beta-carotene and vitamins C and E.
Bronchospasm is a serious, but treatable health condition. The wheezing and coughing symptoms may put you in an uncomfortable position, but the more severe issue of difficulty breathing should be addressed immediately. A variety of natural remedies may be effective for opening the airway passages, as some chemical treatments could worsen the situation. You may even be able to prevent the onset of bronchospasm symptoms with a few simple lifestyle changes. “Home Remedies for Bronchial Congestion,” Organic Facts; https://www.organicfacts.net/home-remedies/home-remedies-for-bronchial-congestion.html, last accessed May 2, 2017. “Asthma and Diet,” Web MD; http://www.webmd.com/asthma/guide/asthma-diet-what-you-should-know#1, last accessed May 2, 2017. “Asthma,” Mayo Clinic; http://www.mayoclinic.org/diseases-conditions/asthma/expert-answers/asthma-diet/faq-20058105, last accessed May 2, 2017.